Serving Allegheny, Westmoreland, Lower Butler, and parts of Washington. 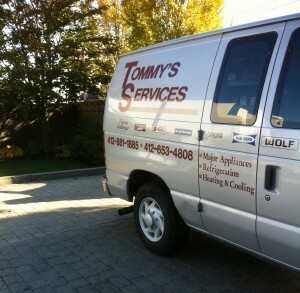 "Tommy’s Service helped get my refrigerator back to working condition in no time at all." Tommy’s Service was established in 1978 founded by Thomas (Tommy) Mingo and joined by son Russell establishing a reputation for friendliness and quality workmanship. His attention to details and care for customer’s home started a loyal following. And Tommy’s Service values your time! In the past, people were almost always available to be home for service. Lifestyles and schedules have changed; today’s pace of life is much different. Therefore, we continue to change the way we work with our customers when scheduling to make our visit as convenient as possible. Our goal is to complete the repair in the first trip.